The Great Temple stands 98 feet (30 metres) high and 115 feet (35 metres) long with four seated colossi flanking the entrance, two to each side, depicting Ramesses II on his throne; each one 65 feet (20 metres) tall. Beneath these giant figures are smaller statues (still larger than life-sized) depicting Ramesses' conquered enemies, the Nubians, Libyans, and Hittites. Further statues represent his family members and various protecting gods and symbols of power. 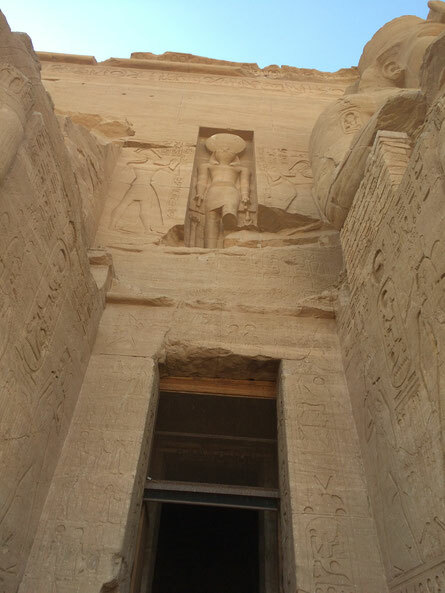 Passing between the colossi, through the central entrance, the interior of the temple is decorated with engravings showing Ramesses and Nefertari paying homage to the gods.